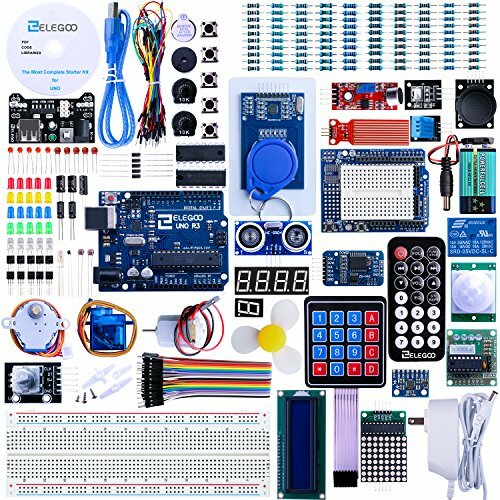 This is the most complete kit for Arduino starters. It is very fun and easy to use. Kit is 100% compatible with all Arduino modules. The 63 parts are packaged in an attractive, convenient container. Component listing: 5pcs White LED 5pcs Yellow LED 5pcs Blue LED 5pcs Green LED 5pcs Red LED 1pcs RGB LED 5pcs 22pf Ceramic Capacitor 5pcs 104 Ceramic Capacitor 2pcs Photoresistor 1pcs Thermistor 5pcs Diode Rectifier (1N4007) 2pcs Electrolytic Capacitor (10UF 50V) 2pcs Electrolytic Capacitor (100UF 50V) 5pcs NPN Transistor (PN2222) 5pcs NPN Transistor (S8050) 1pcs Tilt Switch 5pcs Button (small) 1pcs 1 digit 7-segment Display 1pcs 4 digit 7-segment Display 1pcs Sound Sensor Module 1pcs LCD1602 Module ( with pin header) 1pcs IC L293D 1pcs IC 74HC595 1pcs Active Buzzer 1pcs Passive Buzzer 1pcs RTC Module 1pcs DHT11 Temperature and Humidity Module 2pcs Potentiometer 1pcs Rotary Encoder Module 1pcs Joystick Module 1pcs Keypad Module 1pcs 5V Relay 1pcs IR Receiver Module 1pcs UNO R3 Controller Board 1pcs Breadboard 1pcs Servo Motor (SG90) 1pcs Stepper Motor 1pcs ULN2003 Stepper Motor Driver Board 1pcs Prototype Expansion 1pcs Power Supply Module WARNING: Pls. do not use the voltage higher than 9V 1pcs HC-SR501 PIR Motion Sensor 1pcs Ultrasonic Sensor 1pcs GY-521 Module 1pcs 3V Servo Motor 1pcs MAX7219 Module 1pcs Remote 1pcs 9V 1A Power Supply 1pcs 65 Jumper Wire 1pcs Water Lever Sensor 1pcs USB Cable 1pcs 9V Battery with DC 1pcs RC522 RFID Module 10pcs Resistor (10R) 10pcs Resistor (100R) 30pcs Resistor (220R) 10pcs Resistor (330R) 10pcs Resistor (1K) 10pcs Resistor (2K) 10pcs Resistor (5K1) 10pcs Resistor (10K) 10pcs Resistor (100K) 10pcs Resistor (1M) 20pcs Female-to-male Dupont Wire.